Harvard's Jonah Travis goes up for a layup. 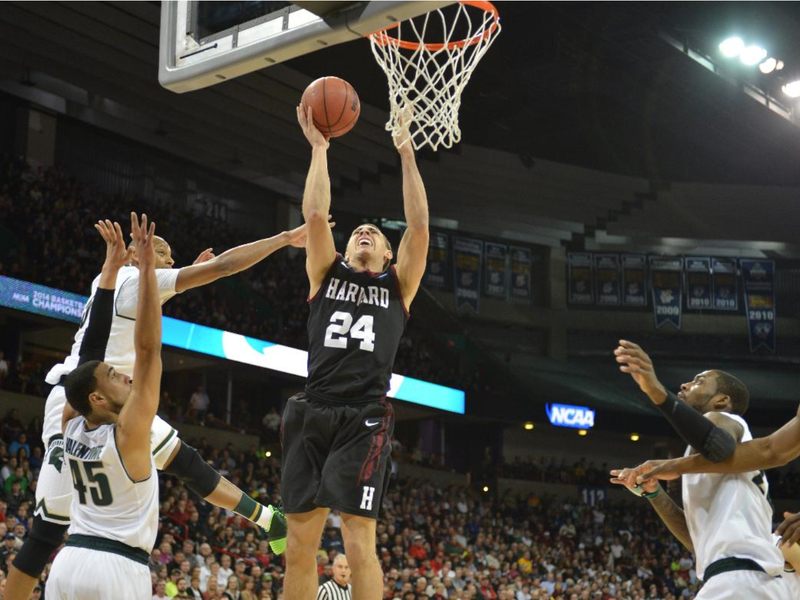 With a stunning 29-11 run in the second half, the Harvard men’s basketball team brought the crowd in Spokane to a frenzy, coming back from a 16-point deficit to take a 62-60 lead with 7:12 to play in their NCAA tournament game against heavily-favored Michigan State. Nonetheless, the Spartans, ranked first in the country early in the year and picked by many to win the NCAAs, found enough counters in the closing minutes to hold onto an 80-73 victory. The Spartans began the game on a roll, using their speed and size to convert an early rash of Harvard turnovers into fast-break points. State’s shooting sizzled: they converted 12 of 18 shots in the first half, with guard Branden Dawson carding 20 points on only 12 shots from the field. (He finished as the game’s top scorer with 26 points. Michigan State star Adreian Payne, who canned 41 points against Delaware in their prior game, was held to 12 points.) The Spartans coughed up only one turnover in the half, and while the Crimson kept their poise, they couldn’t find their offensive rhythm and trailed, 45-33, at the break. The second stanza began with a couple of Spartan dunks and seven missed Harvard shots. The game looked headed for a blowout when State took its biggest lead at 52-36. But suddenly the Crimson roared off on a 19-3 run during which Steve Moundou-Missi ’15 took over the game at both ends of the court—rebounding, blocking, and dunking. His resonant dunk after a turnover made it 55-51, bringing the crowd to its feet, and when co-captain Laurent Rivard ’14 drained a three-pointer from the corner with 7:12 left, Harvard went up 62-60, stunning many in the seats. State had scored only one field goal in a span of 7:25. That was Harvard’s first—and only—lead of the night. To their credit, the Spartans gathered themselves and put together an 8-0 run of their own, going up 68-62. Though the Crimson valiantly kept coming at them, their shooting cooled off and the last of State’s nine steals, with 41 seconds left, nearly put the game on ice. Milestones have become an annual ritual lately in Harvard basketball. The team’s 27-5 season sets a new Harvard record for most victories in a year. Laurent Rivard ended his career with 123 games played, tying Princeton’s Ian Hummer for most in Ivy League history. Wesley Saunders ’15 dropped in 22 points to become the thirty-first member of the Crimson 1,000-point club, with another season yet to play. Rivard’s two three-pointers gave him 80 for the season, matching his own Harvard record.